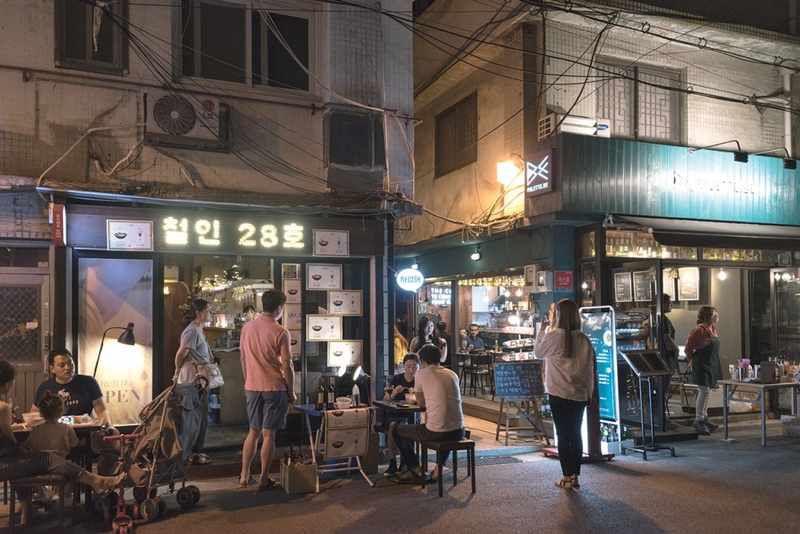 Four years ago, when the area between Samgakji and Namyeong subway stations hadn’t yet been christened with the name Yeoljeongdo, or Passion Island, it resembled a ghost town following a failed redevelopment project. Today, a positive vibe has replaced the desolate atmosphere in Yeoljeongdo, a part of Wonhyo-ro 1-ga, Yongsan-gu. In November of 2014, young entrepreneurs opened six eateries in what was then an underdeveloped area known for its old printing factories. Even though the neighborhood looked bleak, the shop owners believed that they could draw people to the area with their hearty efforts, and thus named it after their own passion to make their businesses successful in what was then an isolated area surrounded by high-rise buildings (a metaphorical island). As their story became known to the media, the name stuck. 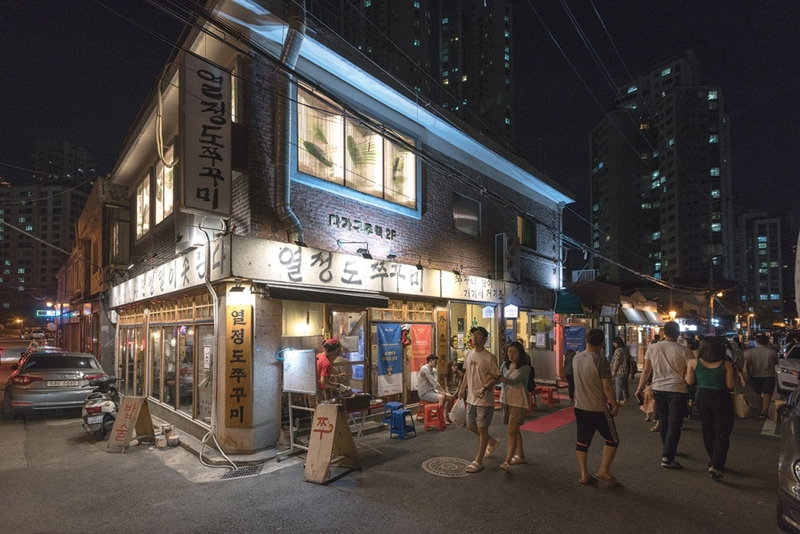 Today, the number of shops in Yeoljeongdo has gone up sevenfold, including the shops in the back alleys, which attract visitors fond of all things retro. The typical destinations for food and drink include Gamjajip, which is located on the main street and is famous for its various flavored fried potatoes and dipping sauces — a perfect accompaniment to beer. Yeoljeongdo Jjukkumi, which you’ll find when you spot the rough, black handwriting on a white signboard, serves a spicy octopus dish cooked in an iron pan. And Dagagujutaek, a second-floor beerhouse, where the structure of an old household is well preserved, provides a unique ambience. Coffee Banjeom, located on one of the side alleys, is an exotic Taiwanese-style café that turns into a pub at night and gives the impression of a shop in Chinatown at first glance. For those who may not want to eat per se, but still feel like hanging out, recommendations include Boombox. With an eye-catching exterior in the shape of cassette player, this craft beer shop takes music requests. Lari and Kelly, located at the starting point of the main street from the Samgakji Station side, is a pet-friendly brunch café. You can enjoy brunch with your pup at your side while admiring intriguing paintings of dogs. Supplies for cleaning up after your pet are also available here. Comcom-oraksil is an amusement arcade where you can play old 16-bit video games like Boggle Boggle, Wonder Boy and Tetris for only KRW 500. Last but not least, Duhwadang is a soymilk and dessert café decorated with a wide variety of vintage items, including a vintage dish collection, and a door of a cabinet inlaid with mother-of-pearl hanging on the wall like an exclusive handcrafted frame. Its drink and dessert menu — all made of soymilk — is only one part of the café’s exquisite attention to detail. On the last Saturday of every month, the Gongjang Night Market is held in Yeoljeongdo to boost community. The name of the night market also came from the origin of the area. Gongjang means “factory” in Korean, but this gongjang is a homonym using different Chinese characters indicating an empty space that recalls what this area used to be. 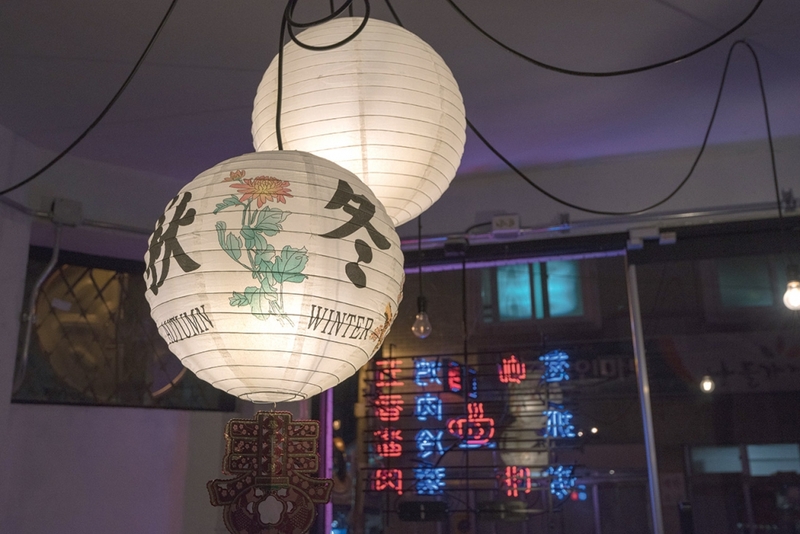 The night market is held from 5 p.m. to 10 p.m. from March to October. Sellers and buskers of food, fashion accessories, stationery and decoration items, who are not based in this area, join the market to entertain visitors. The list of artists and sellers is posted prior to the occasion on their Facebook page, so please check before visiting. 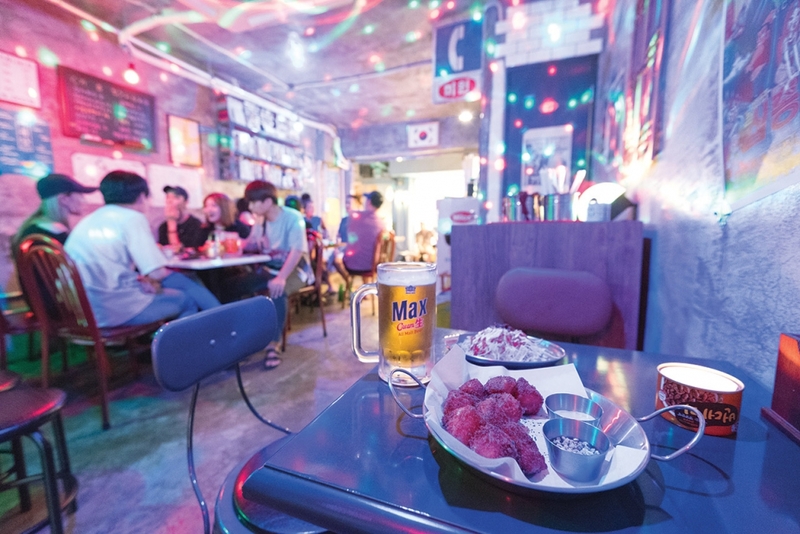 Despite all its renewed energy, Yeoljeongdo can be hardly described as an area of refined, sophisticated shops. But if you are looking for a place where you can spend a laid-back evening, Yeoljeongdo is a noteworthy choice to enjoy Samgakji.